To evaluate the optimal level of public investments, governments regularly conduct cost-benefit analyses in which they weigh the value of the benefits of an investment against the value of the investments’ costs. In many settings, a project’s costs and benefits materialize over different time horizons. This is particularly the case when considering investments to abate the effects of climate change. Indeed, many of the costs associated with climate change, such as large-scale coastal flooding and long droughts, are predicted to occur decades or even centuries into the future. However, societies have to invest today in order to effectively mitigate and reduce these long-run risks. To compare the benefits and costs occurring at different horizons, future values are discounted to the present using a discount rate. When the time horizons are as long as they are for climate change, even small changes in discount rates can dramatically alter policy conclusions. As an example, assume that an investment to reduce carbon emissions costs $30 billion, and is expected to avoid environmental damages worth $1,000 billion in 100 years. At a discount rate of 3%, the present value of those damages is $52 billion and the project appears attractive. At an only slightly higher discount rate of 5%, the present value of the investment drops by an order of magnitude to $7.6 billion, and the project no longer is a good investment. The selection of the appropriate discount rate is therefore of central importance when evaluating investments in climate change abatement. However, until recently, there has been very little direct empirical evidence on the way households discount payments over very long horizons. As a result, academics and policymakers have mostly resorted to theoretical arguments or have tried to infer discount rates from realized returns of traded assets such as private capital, equity, bonds, and real estate. This approach has produced widely varying discount rate suggestions, ranging from close to 1% (Stern 2006) all the way up to almost 5% (e.g. Gollier 2013, Nordhaus 2013). In addition, this approach often ignores important considerations regarding the maturity and risk properties of the investments used to infer discount rates for valuing climate change abatement. To see why such risk and maturity characteristics are important, it is helpful to think of any asset as a portfolio of claims to single payments at specific horizons. For example, an investment that pays off some cash flows for the next ten years can be thought of as a portfolio of ten claims to single annual cash flows. Asset pricing theory teaches us that the rate at which each of these expected payments should be discounted depends on the situation in which the payment is realized. In particular, payments that materialize primarily when investors are doing relatively well (when their “marginal utility of consumption is higher”) are considered more risky and therefore less desirable than payments that pay off in bad states of the world (such payments are sometimes called “hedges” and are similar to insurance contracts). Payments that are more risky therefore need to be discounted at a higher rate; in other words, in order to compensate investors for the higher risk inherent in these payments, they have to offer a higher return. In addition, since the riskiness of payments can vary by horizon, each of the single payments of the portfolio might have a different per-period discount rate. The average rate of return to an asset only captures the value-weighted average discount rate applied to all its payments. Therefore, it is not necessarily informative for discounting the payments of climate change investments, which tend to occur at much longer horizons and might have substantially different risk profiles. To make progress on a data-driven approach to selecting discount rates for investments in climate change abatement, I have worked with a number of co-authors to provide estimates of the term structure of discount rates for an important asset class – real estate – over a horizon of hundreds of years (Giglio et al, 2018). We start by estimating the average return to real estate, which we find to be above 6%. In combination with recent estimates from our earlier work in Giglio et al (2015), where we found the discount rate for real estate payments 100 or more years into the future to be around 2.6%, this implies a downward-sloping term structure of discount rates for real estate. Following Giglio et al (2015), our empirical analysis focuses on the US, the UK, and Singapore. To estimate the average return to real estate in these countries, we employ two complementary approaches. The first approach, which we call the “balance sheet approach,” is based on information from the three countries’ national accounts. It combines the total value of residential real estate and housing with the total value of real estate and housing services consumed by households (the ‘dividend’ from the real estate and housing stock). After controlling for the growth of the real estate and housing stock over time, we obtain a return series for a representative property. Our second approach, which we call the “price-rent approach”, constructs a time series of returns by combining a house price and a rental price index with a price-rent estimate for a baseline year. After adjusting both results for inflation and subtracting maintenance costs, depreciation, and any tax-related decreases in returns, we obtain real expected returns for real estate that are around 6%. These return estimates are substantially above the risk-free rate and imply a positive real estate risk premium. 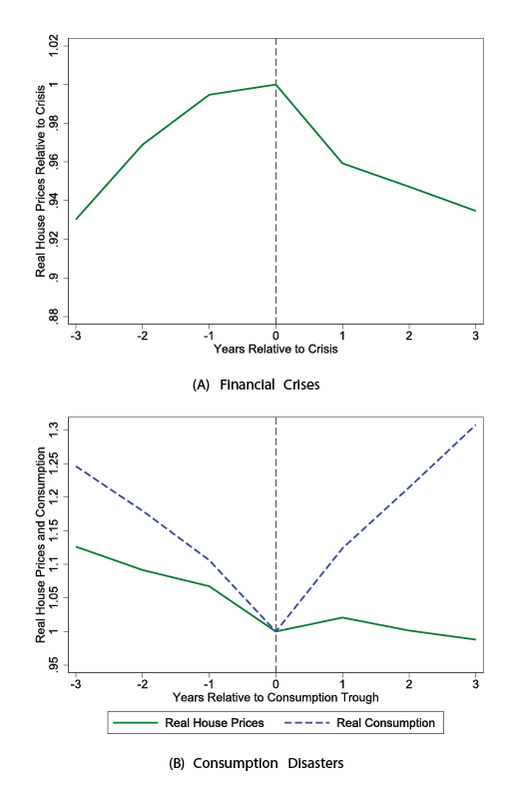 Consistent with the notion of real estate as a risky asset, Panel A of Figure 1 shows the average reaction of real house prices to financial crises. Financial crisis dates for 20 countries over the period 1870-2013 are based on Schularick and Taylor (2012), Reinhart and Rogoff (2009) and Bordo et al. (2001). The onset of a crisis is normalized as time zero and the house price level is normalized to one at the beginning of the crisis. On average, house prices rise in the three years leading up to a crisis, peak just before the onset of the crisis, and fall by up to 7% in the following three years. Similarly, Panel B of Figure 1 shows the average behavior of house prices during rare disasters as identified by Barro (2006) and Barro and Ursua (2008). Consumption reaches its trough (normalized as time zero) after declining for three years. House prices fall along with consumption over these first three years, but fail to recover along with consumption over the following three years. We also demonstrate that real house prices are positively correlated with consumption growth in general. Both of these patterns contribute to the riskiness of real estate as an asset. In addition to showing that real estate is risky in general, we also document that housing is exposed specifically to climate change risk; we also show that this risk is reflected in house prices. This is important to link the discount rates applicable to real estate and the discount rates for investments in climate change abatement. We use a proprietary data set of housing transaction prices as well as for-sale and for-rent listings for properties located in the coastal states of Florida, New Jersey, North Carolina, and South Carolina. Properties in these states are exposed to climate change risk due to both rising sea levels and hurricanes. To obtain a measure of each property’s physical exposure to climate risk, we geo-code the addresses of all properties to identify those properties that will be flooded with a 6-feet increase in the sea level, as measured by NOAA. Figure 2 illustrates how we identify properties in the flood zone of downtown Miami, Florida. On the left, we plot each property as a green dot and overlay the NOAA’s flood map. Then, on the right, we geocode to identify the properties that fall under the flood zone and color them as red dots. Since physical exposure to climate risk is correlated with unobserved property amenities, such as beach access, we cannot simply compare the prices across properties that are differentially exposed to such risk in order to estimate the price-impact of climate change exposure. Instead, we test whether the prices of properties that are more exposed to climate change fall more when the perception of climate risk increases. We measure perception of climate risk in the housing market by performing a systematic textual analysis of the for-sale listings to measure the frequency with which climate-related text (e.g., mentions of hurricanes or flood zones) appears in the written description of the listed properties. The fraction of listings that include such texts is the basis for a “Climate Attention Index” that we construct at both the zip code-quarter and zip code-year level. Our interpretation of this index is that it reflects households’ perceptions of the risk of future climate change on the cash flows from owning the property. We use data on the universe of property transactions from these states to conduct hedonic regressions that explore how the transaction prices of properties in the flood zone vary differentially when the “Climate Attention Index” changes, controlling for property characteristics and various fixed effects. Our analysis shows that when the fraction of property listings that mention climate change doubles, there is a 2% to 3% relative decrease in the prices of properties that are in the flood zone compared to other comparable properties in the same zip code. We also show that annual rents of exposed and non-exposed properties do not vary differentially with movements in our “Climate Attention Index.” This confirms that our estimates of differential price movements are not driven by differential changes in the flow utilities, but instead result from a differential change in the risks associated with future cash flows. We conclude that real estate prices directly reflect climate risk, making it a particularly interesting asset to study the valuation of investments to mitigate such risks. To estimate the full term-structure of housing discount rates, we combine our estimate of the average rate of return with estimates of the long-run discount rate hundreds of years into the future. In that part of the paper, we rely on our earlier work, presented in Giglio et al (2015). In the UK and Singapore, residential properties trade either as freeholds, which are permanent ownership contracts, or as leaseholds, which are pre-paid and tradable ownership contracts with finite maturities between 99 years and 999 years. 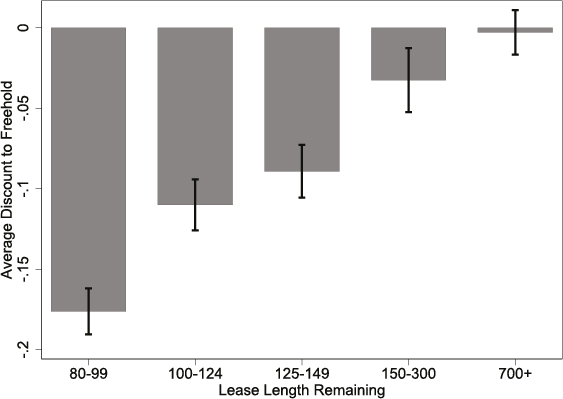 By comparing the relative prices of leasehold and freehold contracts for otherwise identical properties, Giglio et al (2015) estimated the present value of owning a freehold after the expiration of the leasehold contract. Figure 3 reports the estimates for the UK between 2004 and 2013. It shows that price discounts of leaseholds are strongly associated with maturity. In particular, leaseholds with remaining maturities between 100 and 124 years trade at a discount of 11% as compared to infinite-maturity freeholds. Put differently, at least 11% of the value of a freehold is due to payments accruing more than 100 years into the future. After ruling out alternative explanations, the Giglio et al (2015) conclude that this implies a discount rate of 2.6% for payments more than 100 years into the future. In combination with the average rate of return of more than 6% (see the discussion above), this implies a downward-sloping term structure of discount rates for real estate. In order to explore the implications of the downward-sloping term structure of risky real estate for valuing climate change abatement, we build a simple and tractable asset pricing model that incorporates crucial features of climate change and its related risks. Our baseline model builds on the view that climate change is a form of disaster risk (Weitzman, 2012; Barro, 2013): it is a rare event with potentially devastating consequences for the economy. We embed this view in a general equilibrium model with a representative agent and complete markets based on the endowment economy. We further modify this classic setup to reflect a central important messages of the climate change literature: the fact that the economy can adapt and partially mean-revert following a climate disaster. This is important to match the downward-sloping term structure of housing discount rates: For assets exposed to the disaster risk, the partial mean reversion of the economy after a disaster implies that short-term cash flows are riskier than long-term cash flows. Intuitively, while short-term cash flows are exposed to the full extent of the disaster (should it occur), long-term cash flows are less exposed since they occur after the economy has partially recovered. Since climate change is a form of disaster risk, investments in the mitigation of this risk act as hedges: similar to insurance policies, they pay off primarily in bad states of the economy, and are thus particularly valuable. This has a number of important implications for the discount rates used to value their cash flows. The first implication is that the shape of the term structure of discount rates for investments in climate change abatement is the opposite of what we estimate for the term structure of housing, a risky asset. In fact, the term structure should be upward-sloping. In other words, hedging against effects of the disaster on short-term cash flows is more valuable than hedging the effects on long-term cash flows, since these long-term cash flows are affected less due to adaptation. However, this upward-sloping term structure does not imply that the level of discount rates for investments in climate change abatement is high at any horizon. In fact, it should be below the risk-free rate at all horizons, reflecting the investment’s hedge characteristics. For shorter horizons, we can observe the real risk-free rate (real bond yield) directly in the data, providing us with a tight upper bound (1% - 2%) on the discount rate for short term cash flows from investments in climate change abatement. For longer horizons, there are no reliable estimates of the level of the risk-free interest rate. However, our model suggests that the very long-run discount rate of 2.6% for risky real estate provides an upper bound on the risk-free rate, and therefore also on the discount rates for long-term cash flows from investments in climate change abatement. Note: This research summary is based on a column in VoxEU that summarized the findings from an earlier draft of the paper. Barro, R J (2013) “Environmental protection, rare disasters, and discount rates”, NBER Working Paper 19258. Barro, R J and J F Ursua (2008) “Macroeconomic crises since 1870”, Brookings Papers on Economic Activity, 39(1): 255–350. Barro, R J (2006) “Rare Disasters and Asset Markets in the Twentieth Century,” The Quarterly Journal of Economics, August 2006. Bordo, M, B Eichengreen, D Klingebiel and M S Martinez-Peria (2001) “Is the crisis problem growing more severe?”, Economic Policy, 16(32): 51–82. Giglio, S, M Maggiori and J Stroebel (2015) “Very long-run discount rates”, The Quarterly Journal of Economics, 130(1): 1–53. Giglio, S, M Maggiori, K Rao, J Stroebel and A Weber (2018) “Climate change and long-run discount rates: Evidence from real estate”, NBER Working Paper 21767. Gollier, C (2013) “Evaluation of long-dated investments under uncertain growth trend, volatility and catastrophes”, Toulouse School of Economics TSE Working Papers 12-361. Nordhaus, W D (2013) The climate casino: Risk, uncertainty, and economics for a warming world, Yale University Press. Schularick, M and A M Taylor (2012) “Credit booms gone bust: Monetary policy, leverage cycles, and financial crises”, American Economic Review, 102(2): 1029–1061. Stern, N (2006) Stern Review on the Economics of Climate Change, London, UK: Her Majesty’s Treasury. Weitzman, M L (2012) “Rare disasters, tail-hedged investments, and risk-adjusted discount rates”, NBER Working Paper 18496.